Paprika Cottage, North Adelaide, South Australia, doesn't look like much from the outside. It's a small, heritage cottage alongside the rear gardens of Buxton Manor Mansion that was originally built as the chauffeur's lodgings. However the inside has been beautifully restored and includes a modest two person spa making it an excellent weekend retreat or very homely longer term accommodation. My partner and I recently spent a weekend at the cottage, our second stay, the first being about five years ago, and it was exactly as I remembered it. We love the cottage because it feels more like a home than a hotel room. Very much helped by the views of the gardens that can be seen out of all the windows instead of a city skyline. What makes it feel more homely is that all the furniture and trimmings are all heritage themed, styled or actual heritage pieces. There's no modern looking, flat pack style furniture here. There's also a bit of a William Morris Arts & Craft theme running through the decor - including a William Morris framed print so you can see for yourself the influences. Although the floor plan is fairly narrow it never feels cramped (except maybe with the small dining table up against the back wall which can feel a bit cosy eating breakfast in the mornings). The main lounge, dining, kitchen area is fairly long. The kitchen is a good size for cooking, if that's your thing to do on a holiday, with all the utensils you'll need provided. The lounge includes an open pot belly stove fire place, flat screen TV, DVD player and off course a nice sofa and comfy chair. The main bedroom is pretty basic with side tables, chest of draws, wardrobe and of course a queen size bed. However the bed, in my opinion, is extremely comfortable and I've never struggled to get to sleep on it. A highlight for us, of course, is the spa bathroom. We don't own a spa so that's always something to look forward to. At home we also have a tiny, enclosed shower cubical. It's so great to use the cottage shower which sits directly above the spa and is not enclosed at all (it's also got a shower head that's far bigger than ours). Paprika cottage has high ceilings, exposed wooden beams, great lighting and includes air conditioning units in the main areas to keep everything either nice and warm or lovely and cool as required. There's quite a lot of little quirky detail items decorating the cottage, though I'm not sure about the appropriateness of Golliwogs on the bed in the second bedroom when it comes to international guests? (Are Golliwogs still racially insensitive in terms of their history or do they kind of get a pass as nostalgia?). Location wise, Paprika Cottage is within walking distance of a good selection of restaurants and a cinema if you want to catch a film. If you don't mind a longer walk you can even walk to the central shopping district of Adelaide however the free loop bus service stops very close by and will take you there if walking that distance isn't for you. 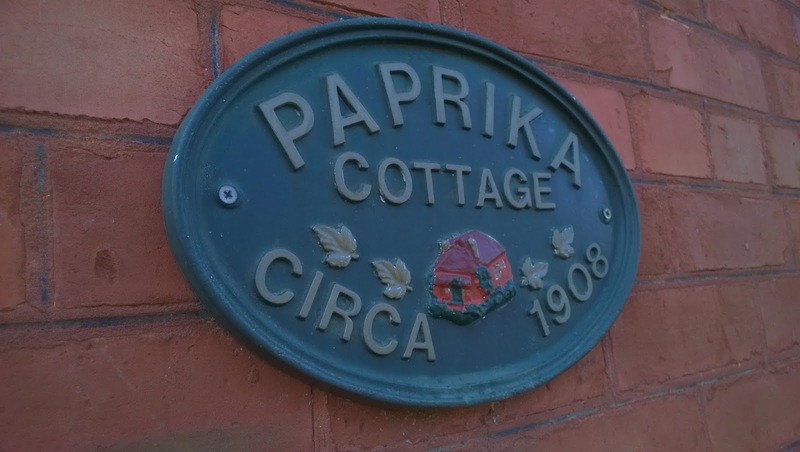 Paprika Cottage is part of the North Adelaide Heritage Group's series of Heritage cottages. My partner and I enjoy Paprika Cottage for it's modest size and usually quite affordable rates (generally it's the cheaper option of all the apartments on the Buxton estate). If you want something a little grander you might want to check out the apartments in the Manor its self. You can book online from the group's website.